When we left off, I was debating which piece of equipment to leave behind in order to pick up a shiny new hull-smasher laser. In the end, I ditch my unused anti-ship drone. I have only limited power available for the drone control unit, and I want to focus on the life-saving defensive drone. We make it to the end of Sector Seven without incident. Bring it on! For the Federation! This time I remember to turn on the defence drone at the start! The Rebel does little damage as a result, and the grateful Federal survivors hand me some supplies. I back up my save again, and carry on. 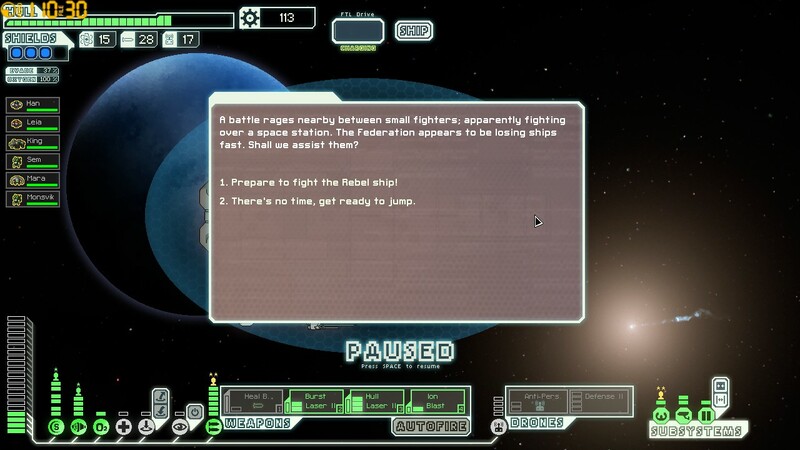 A second Rebel is just a speed bump, and then it’s onto the flagship. The fight is long (my Dxtory recording comes to over 30 minutes!) and, to be frank, a bit tedious once I’ve destroyed most of the flagship’s weapons. At this point, I just have to wait for my weapons to do enough damage. 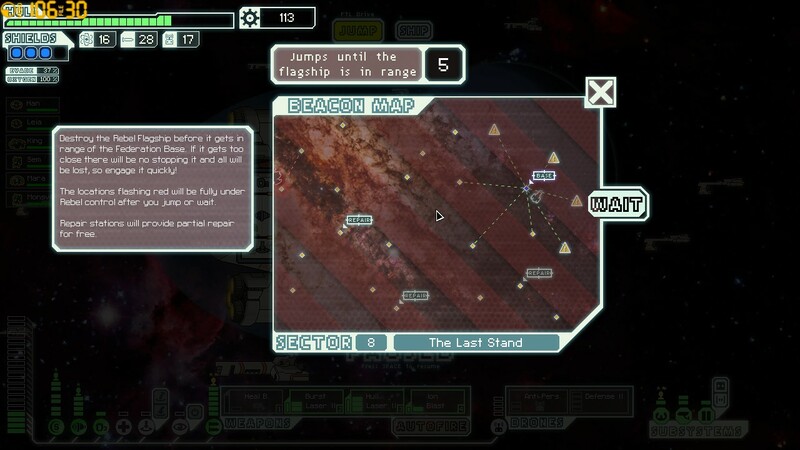 However, the tipping point comes once I use my Mantis boarders to whittle down the flagship’s crew, at the same time I use the fire bomb I purchased back in sector 6 to set the flagship’s med bay alight. This prevents the crew from simply running away from the Mantes, healing up in the med bay, and running back to pick off my weakened boarders. Even then, it’s chancy – I lose my second crewmember this game, Mansvik the Mantis – but his sacrifice isn’t in vain. Eventually, most of the flagship’s crew is dead, save for one gunner in the forward compartment. Mopping up is easy after that. 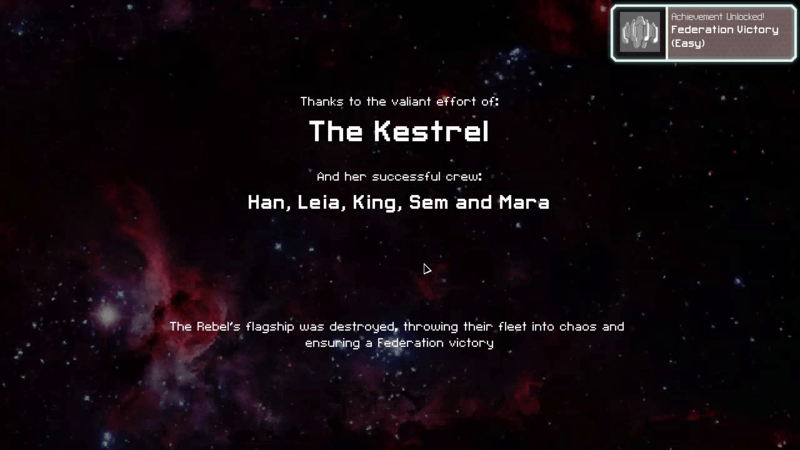 The most effective way of taking down the flagship, if you can kill the crew first so they can’t extinguish the fires. At the end of the fight, the battered flagship jumps away. I back up my save yet again, and prepare to give chase. … and die horribly when my cloaking device – the key to my survival! – gets knocked out by an unlucky hit. This is why I backed up the save, because I’m not starting this LP (or playing that half-hour flagship battle) again. Let’s try that one again. This time it goes much better. A quick barrage of firebombs, and Sem the surviving Mantis, take care of most of the flagship’s remaining weapons. 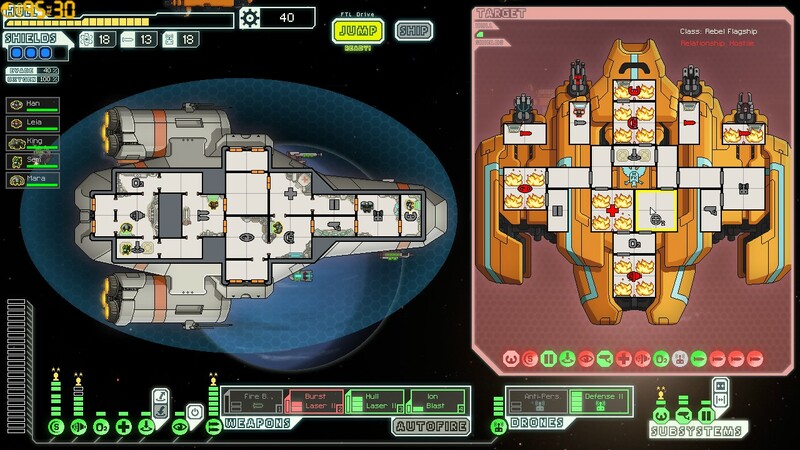 I dust off my anti-boarder drone, and that takes care of the boarding drones the flagship sends my way. 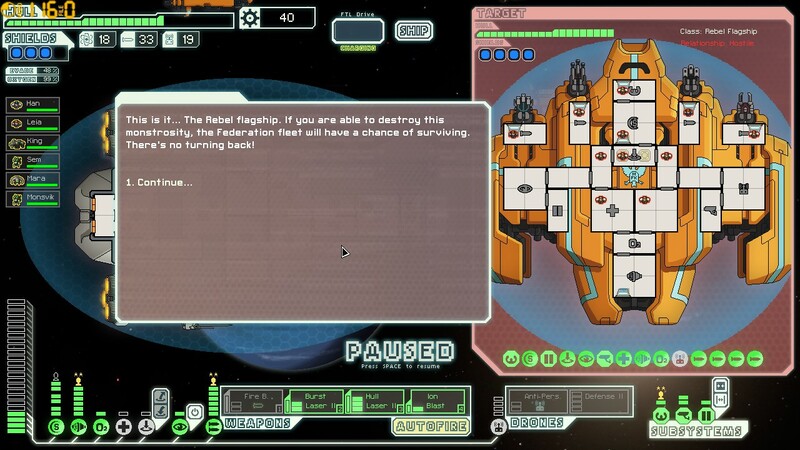 The cloaking device stays intact, and I can survive the worst the flagship throws at me. Soon the battle is over. I back up my save once more, spend the last of my scrap, and head off to fight the third and final phase of the flagship. I have to reload twice – this time, the flagship carries Zoltan shields that prevent me from quickly disabling its most dangerous weapon, a triple missile launcher, with my boarders/firebombs. In the time it takes me to lase the shield down, the flagship pulverises me. Cloaking barely helps, as using the cloak against the missiles meant it wouldn’t be available against the flagship’s special attack, and vice-versa. But on my third attempt, I pull it off! Eventually I bring down the flagship’s shields, and soon after, the missile launcher. Once the launcher is out of commission, it’s smooth sailing. And that’s it for this playthrough! For players who want to try saving the Federation again, beating the flagship unlocks a new ship type, the Federation Cruiser. (There are nine ships, plus variants, in the game – so there is room for completionism.) 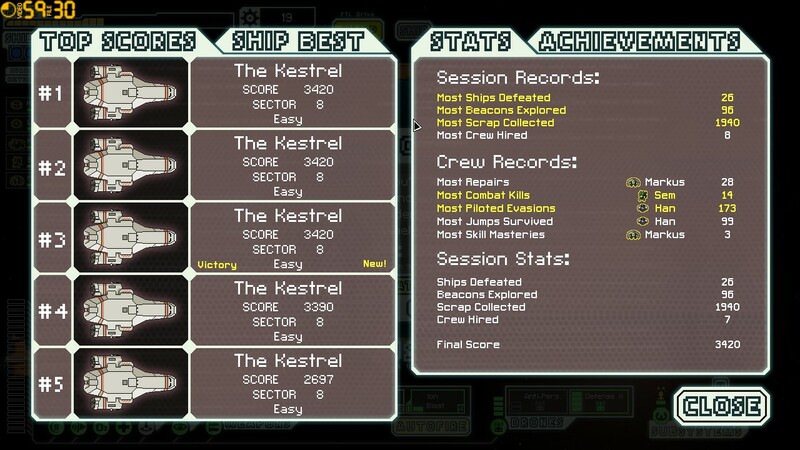 But for now, I think I can rest on my laurels and proclaim myself done with FTL. Thank you for following along, and I hope you had as much fun as I did! Next Next post: Armageddon Empires (and siblings) 50% off!